Is using the phrase ‘Republic’ a violation of the law? 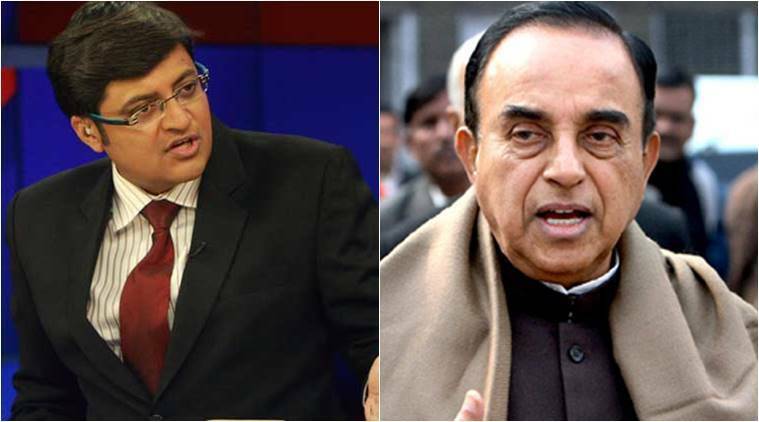 BJP Rajya Sabha MP, Subramanian Swamy shot off a letter to the Union Ministry of Information & Broadcasting about the use of the phrase ‘Republic’ by Arnab Goswami’s new media venture. But is it legal to use this phrase? BJP Rajya Sabha MP, Subramanian Swamy shot off a letter to the Union Ministry of Information & Broadcasting about the use of the phrase ‘Republic’ by Arnab Goswami’s new media venture. 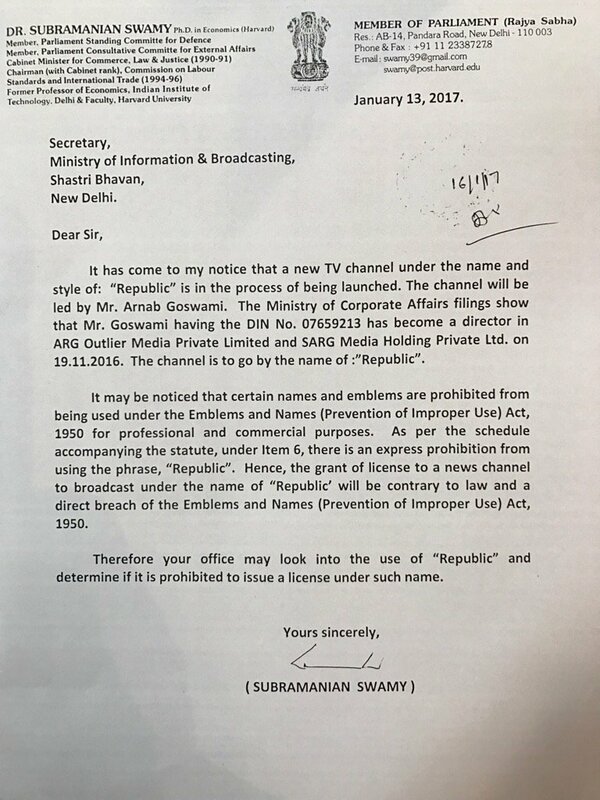 In his letter, he mentioned that the use the phrase ‘Republic’ by Arnab Goswami’s new media venture will be a violation & a direct breach of “The Emblems & Names (Prevention of Improper Use) Act of 1950.” But is it really a breach of the law? The act was passed in 1950 to prevent the improper use of certain emblems and names for professional and commercial purposes. The act prohibits any person from using certain names & emblems as listed in the schedule of the act for the purpose of any trade, business, calling or profession, or in the title of any patent, or in any trade mark or design. However, the central government can issue permission in certain special cases. The act also prohibits registration of any company, firm or any other organization with the restricted names. The penalty for contravention of the act is a mere five hundred rupees. The central government is authorized to add as many items to the schedule as it deems fit. The following are some of the items listed in the schedule. With time, more names were added to the schedule. The current list of prohibited names include International Civil Aviation Organisation, Interpol, World Meteorological Organisation, Tuberculosis Association of India, International Atomic Energy Agency, Ashoka Chakra, Dharma Chakra, Rama Krishna Math, Sri Sarada Math and Ramakrishna Sarada Mission, The Bharat Scouts and Guides, International Olympic Committee, National Youth Emblem, Auroville, Sri Sathya Sai Central Trust, Sri Sathya Sai, National Human Rights Commission etc. Subramanian Swamy’s letter objects to the use of the phrase ‘Republic’, listed in the sixth point of the schedule. But the prohibition may not be really about the phrase alone, but usage of ‘Republic of India’ as a whole. In fact, as per data available on the website of Ministry of Corporate Affairs (MCA), there are 25 companies that have the phrase ‘Republic’ in the name of the company. Some of these companies were registered as late as in the 1950s. The companies range from Engineering to Cargo to Films to Healthcare to Sports, Fashion etc. The act also mentions that “the words such as ‘India’,. ‘National’ or ‘State’ may not be allowed in the name of a body engaged in commercial, semi-commercial activities in public dealings or for products being marketed if the consumer is likely to gather a misleading impression that the organization has been sponsored by the Government”. There is no express prohibition on these words and the individual cases are dealt by the Ministry of Consumer Affairs (MoCA). MoCA clears names and issues no-objection certificates regularly. MoCA also objects to certain names. But it is highly unlikely that the use of the phrase ‘Republic’ will be objected to. Next Article When is a Political Party recognized as a National or State Party? How come, National Spot Exchange Ltd used the word National being a private exchange.